Every year Sustainable Connections honors five local businesses that are taking steps towards achieving a healthy triple bottom line–taking care of employees, our environment, and the local economy–with a Sustainability Champion Award. Drawn from the four tenets of our mission, the awards celebrate local businesses who are leaders in Strong Community, Healthy Environment, Meaningful Employment, and Buying Local First, as well as a Lifetime Achievement Award. This year’s Meaningful Employment Award goes to A-1 Builders & Adaptations Design Studio! This award goes to a local company that provides employment opportunities that engage employees, provide livable jobs, and plans for the future. A-1 Builders has been in business for over six decades and is dedicated to setting the standard in Whatcom County for quality remodeling, repairs, green building, and beautiful design. Current owners Rick Dubrow and Cindi Landreth have created a working culture and environment that according to many employees truly honors the definition of meaningful employment. They have worked hard to provide exceptional benefits for all employees, and now on their way to retirement, Rick and Cindi are in the process of selling their entire business to eligible staff, making this worker-owned cooperative a business that will continue to support the many individuals that run it for years to come. 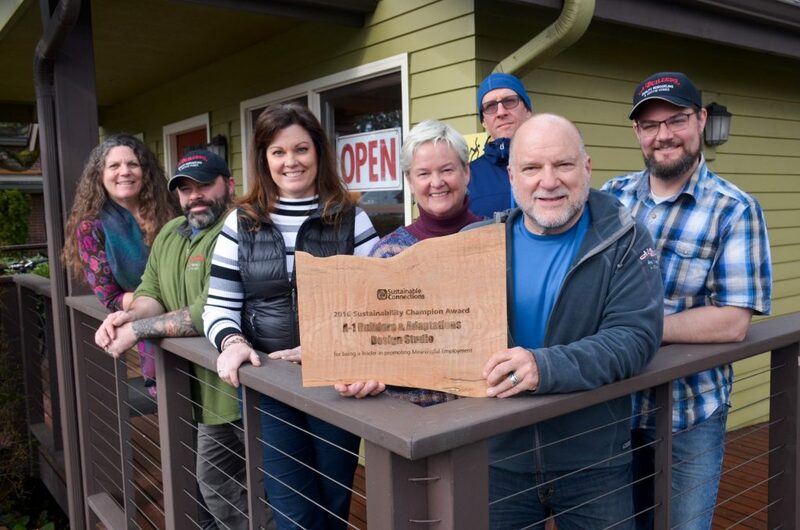 Big congratulations to A-1 Builders & Adaptations Design Studio, we’re excited to see this business transform into a cooperative, and know they will continue to be a successful and amazing local business. Learn more and start a project with A-1 Builders today!